Model: 1 Warranty: 45 days money back guarantee. 【High-Effiency】 Max capability 2000ml for a long and non-stopping moisture, removes up to 600ml of moisture per day from damp air at 15-30 degrees, 40-80% RH. 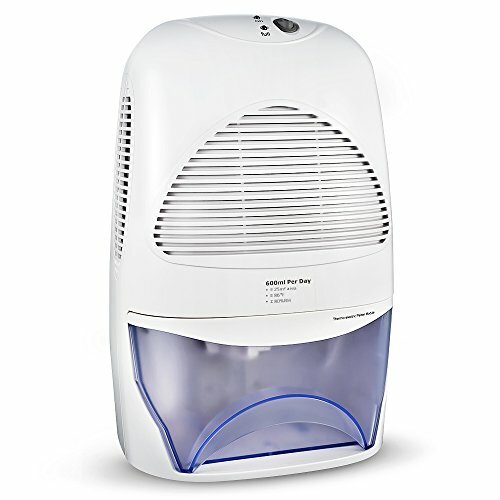 This portable dehumidifier equipped with overload protection device inside in order to make you feel at ease. This device will be a good helper for your life. 【Ultra-Quiet】 Adopted Peltier Technology, the sound created do not exceed 40dB, which means you can read a book or have a nap without any bothering noises, provide a clean and quiet atmosphere for your family. 【Compact Design】 Unlike many electronic dehumidifiers with 2L water tank are heavy and unsightly. This is a very unique dehumidifier which does the job of a full size dehumidifier in a portable size, good for a bedroom, windowsill, closet or utility room. 【Auto Shut-off & CE UL Certificated】The dehumidifier will automatically shut off with yellow LED indicator when the water tank is full. Do not need to worry that it will spill when you are asleep. Approved by CE and UL, it is an extremely safe household electric appliance. 【100% Satisfaction Guarantee】iKich provide ❤45 days money back guarantee, 18 months worry-free warranty ❤ and 24 hours good customer service. We will deal the problem in first time we received your email.